Enhancing your armor and weapons with Enhancement Cards grants a bonus to your attack and defenses, but there are also other options to give you even better stats. 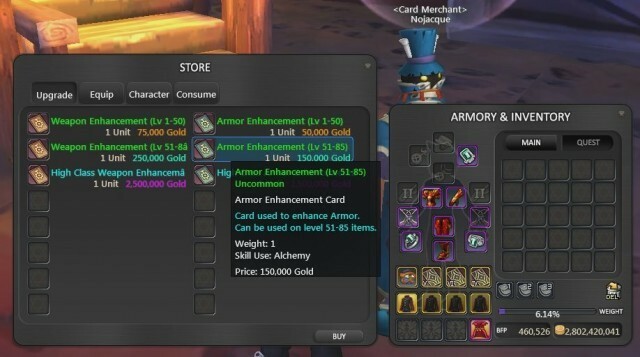 To enhance your armor, go to the General menu and select Enhance Item, or simply double-click on an Armor Enhancement Card to open the Enhancement window. Drag your Armor Enhancement Card into the Card slot and your armor piece into the Item slot and click the Enhance button to start. Armor can be enhanced upto 10 times and each successful enhancement gives your piece of armor extra Physical and Magical Defense. Armor Enhancement Cards can be purchased from Nojacque in Terminus. Weapon enhancement works exactly the same as armor but you need to use Weapon Enhancement Cards. Weapons can also be enhanced upto 10 times and each successful enhancement gives your weapon extra Physical Attack or Magical Attack & Healing depending on the weapon type, and a glow effect that gets stronger the higher the enhance level. Generally, Swords, Daggers and Guns gain Physical Attack, Staves and Rods gain Magic Attack & Healing and Shields gain Physical and Magic Defense. Weapon Enhancement Cards can be purchased from Nojacque in Terminus. Advanced Armor Enhancement Cards are just like the normal enhancement cards and used in exactly the same way and give exactly the same bonus to defense, but they also give an extra bonus effect depending on the type of armor it is used on. 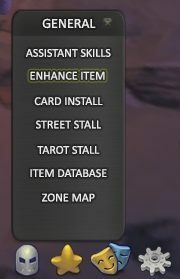 Advanced cards are created by Alchemists using the Alchemy Assistant Skill but you can always find them for sale on the Sales Assistant or Street Stalls. Advanced Weapon Enhancement Cards are also made by Alchemists. They give the same bonus to attack and healing as the normal enhancement cards as well as an extra bonus effect and a different glow. Getting your items to +5 is cheap, fast and easy, but then it starts to get more difficult. Sometimes your enhancement will fail, and sometimes even drop a level. There are several options to improve your chances. You can purchase High-Class Enhancement Cards from Nojacque that have a higher chance of success and you can also purchase Enhancement Increase Scrolls from May in Terminus. 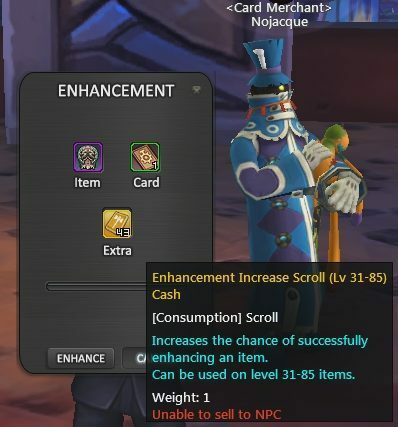 These scrolls are placed into the Extra slot of the Enhancement window and increase the chance of succeeding even more.